Price applies to most vehicles; for a limited number of vehicles with air filters in hard-to-access locations, additional time and charges may apply. Price applies to most vehicles; for a limited number of vehicles with hitches in hard-to-access locations, additional time and charges may apply. Depending on the style of your new wheels, new lug nuts may be required for installation. Our lug nut kits are available in chrome and black and will be selected based on the best match for your new wheels. Price applies to most vehicles; for a limited number of vehicles with head lamps in hard-to-access locations, additional time and charges may apply. What will our Road Hazard Warranty do for you? Pep Boys will follow its Puncture Repair Procedures to determine if your tire should be repaired, at no expense, or replaced under this coverage. While the repair cost is free, there will be a charge for re-balancing a repaired tire. Road Hazard Warranty can save you the expense of tire replacement. If your Pep Boys tire becomes unusable due to a road hazard related mishap and cannot be repaired, we will, subject to pro-rated adjustment based upon the remaining usable tread on the tire, replace the unusable tire or give you a refund. While Pep Boys will remount the tire for free, there will be a cost for re-balancing the replacement tire. Coverage extends to such damage as unrepairable tread punctures damage from potholes, nails, glass and jagged metal which cause cuts, snags, punctures, impact breaks, bruises and rim cuts. Protect your brand new tires from uneven wear by adding an alignment to your installation. Help maximize the life of your new tires by adding an alignment to your installation today. The Ziex ZE950 A S incorporates the latest in technology and design to create an excellent choice for drivers of today s sedans, sports cars and crossover vehicles, where mileage, all-season and high performance handling are a priority. Using the Falken exclusive DRT dynamic range technology in the all new silica tread compound and asymmetric tread design, the ZIEX ZE950 provides optimum levels of dry, wet, ice and snow grip as well as delivering long tire wear. Falken exclusive Canyon- Sipe Technology. Increased edges for ice breaking, better handling and improved wear. Wide circumferential grooves for enhanced wet handling. Wide angled tread slot provides additional snow grip. Dynamic Range Technology - Falken exclusive silica tread compound that enhances the operating temperature range. Sculpted Groove wall provides better snow grip ad eliminate rain groove wander. Falken Tire Corporation launched its brand in its native country of Japan in 1983 and was introduced to the North American market two years later. 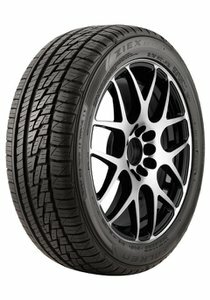 At its inception, Falken was created as the flagship high performance radial brand under Ohtsu Tire and Rubber. Now, over two and a half decades later, Falken has become a well-known, stand-alone brand that focuses on UHP (Ultra High Performance) products while utilizing professional motorsports racing to further develop and improve passenger vehicle products for worldwide distribution. Safety Rating is a combination of two values: Load Index and Speed Rating for P-Metric and Euro Metric tire sizes; and Load Range and Speed Rating in the case of heavy duty LT (light truck) sizes. Speed Rating is based on the speed that the tire is designed to be driven at for extended periods of time. All tires in the in the U.S. are designed to maintain legal U.S. speed limits. 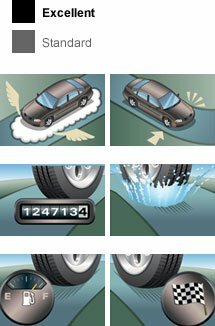 The speed rating of tires must match the maximum driving speed of the vehicle. Load Index is used on P metric and Euro Metric sized tires and denotes a tire's load-carrying capacity at a specified inflation pressure. The load index is represented by a number, the higher the Load Index Value the greater the load the tire can safely carry. Vehicle manufacturers recommend a maximum load capacity based on a recommended minimum load index. Tire Class reflects how the tire will be used. There are four major categories: All-Season, Max Performance, Summer-Only and Winter-Use. All-Season tires are suitable for year-round driving in all weather conditions. Summer-Only & Max Performance tires are specifically designed for high-performance driving. Tire compound, tread design and speed ratings all combine to hug the road and maintain grip. Summer tires by natur e are not ideal for winter driving due to lack of siding to grip winter roads. Winter-Use tires have tread compounds and patterns that are specially designed for grip on s nowy or icy road surfaces. They are not suitable for year-round use. The rubber compound used will wear more quickly on dry, s ummer roads. It is recommended that winter tires are fitted as a complete set to avoid potential handling issues. Tread Type is an important consideration when choosing a tire. There are four main types: Passenger, Highway, All-Terrain and Mud-Terrain. Passenger denotes a tread that is suitable for normal use, a good all-round tread for normal driving. Highway is a tread type unique to SUV and truck tires. The tread is optimized for normal everyday driving on paved surfaces. These tires can be driven off pavement, but are not ideally suited for off road traction. Highway tread patterns deliver a quiet ride. For light trucks and specialty vehicles, All-Terrain tread types provide better off-road traction than standard highway truck tires. There more aggressive tread tends to be less quiet on paved roads. All Terrain tires are suitable for everyday use. Mud-Terrain treads are specifically designed with wider tread blocks and higher void ratios to gain traction in off-road conditions. Mud Terrain tires can generate higher noise levels and tend to carry lower mileage warranties than other tread designs. UTQG (Uniform Tire Quality Grade) is made up of three values: treadwear, traction and temperature. Treadwear is a relative numeric score, based on manufacturer tests, showing how well a tire can be expected to wear compared to other tires. A higher score means a tire could be expected to wear better. Traction measures the tire's ability to stop a vehicle on wet roads. It doesn't reflect a tire's acceleration, cornering, or hydroplaning performance. Traction grades range from AA (highest) to C (lowest). Temperature grades the tire's ability to withstand heat build-up, with A being the highest grade and C the lowest. All tires have the following six performance characteristics, divided into three sets of trade-offs. In most cases, a tire may perform excellently in one characteristic but only standard in the other. Handling: Get stiff side wall for precise steering and cornering but settle for a firm ride with increased road noise. Ride Comfort: Enjoy a quiet, smooth ride but lose some cornering ability. Traction: Stop faster in wet conditions but expect a shorter tread life. Treadwear: Get long, uniform wear across your tread pattern but expect less traction in wet conditions. High-Speed Performance: Get increased performance at higher speeds but sacrifice some fuel economy. Low Rolling Resistance: Enjoy improved fuel efficiency but expect less high-speed cornering ability.